Recently we began a campaign to educate authors against the use of private label rights (PLR) articles because you look like a fraud to us, among other issues, such as not being able to authenticate the true legal source of the content. 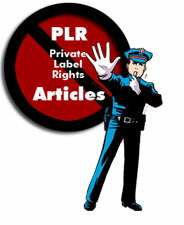 Answer: Any article that you do not own the exclusive right to the content is a PLR article… meaning, any article that can be branded or labeled under any author name is a private label article. You don’t know who really wrote them and often times they were stolen or plagiarized works. You are responsible for anything you post under your name or URL and thus it’s a lot like pedaling stolen merchandise. You are not going to fool us and you are not going to fool the search engines no matter how much you mix and mash your PLR articles. Do the right thing: Don’t buy Private Label Rights articles. Don’t buy products that create or mix and mash PLR articles. And most of all, don’t waste your time or our time by sending them in to us as we are going to reject them. What should you do? Continue writing great original content, month after month, year after year. Do you really want to be accused of submitting stolen works? “Private Label Articles” are the downside of the article marketing industry. On several occasions I have been asked to rewrite batches of these articles but have refused on the grounds that the work truly belongs to another author. Ghostwriting for one person is one thing, writing articles that can be claimed by bunches of “authors” is another. Besides, they can’t afford my editing fees!